We already broke down the 2016 La Liga season, so we move north to examine the English Premier League. In one of the most exciting EPL seasons of all-time, an unlikely champions rose, and a juggernaut fell. Check out some of the other highlights of the season below. We begin the awards honoring a player from Leicester City, and you better get used to it. No team was a bigger surprise this year, or quite possibly in history, than the English champion Foxes, and the driving force behind their incredible run was Riyad Mahrez. 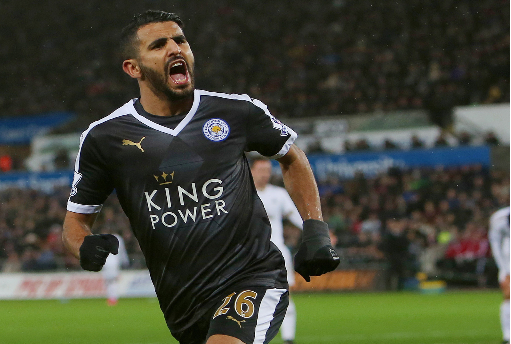 Coming over from the second division of France in 2013-14, Mahrez labored through his first two years in England. He scored a grand total of 4 goals last season, while nearly watching his side get relegated in the process. Coming into this season, somehow, in something straight out of the movie “Like Mike," Mahrez and his teammates transformed into superstars. No one was more instrumental than the Algerian winger, putting up 17 goals and 11 assists, serving as the engine to Leicester's now world-famous counterattack. If he got on the break with only a single defender on him, there was little doubt Leicester would be in on goal. His 3.5 dribbles per match were second best in the league, often time leaving his marker mesmerized like a snake charmer, but his most impressive quality this season was his consistency. In the 36 league matches he featured in, not once did he appear to have an off game. The fact that Leicester could rely on him to spur its attack and help win matches week in and out -- in a season full of close-as-can-be 1-0 wins -- was crucial to them eventually lifting the title. Honorable mention: David De Gea (Manchester United), Jamie Vardy (Leicester City), Harry Kane (Tottenham). Coming into this season, Chelsea fans were brimming with confidence and for good reason. Jose Mourinho had brought the league title back to Stamford Bridge, and had done so in dominating fashion. The transfer window saw long-time Blues Ramires and Petr Cech depart, but concern was not abundant as Pedro was signed from Barcelona and their goalkeeper in waiting was none other than the world-class Thabo Courtois. Unfortunately, that’s where the optimism began and ended. Right out of the gate Chelsea struggled, losing 3 of their first 5 games, seemingly never able to recover in putting forth a respectable title defense. At one point it got so bad they sank to 14th place, leading to Jose Mourinho’s astonishing firing in the middle of the season, keeping his streak of never lasting in a job more than 3 years alive and well. Hey, at least the guy's consistent. With Guus Hiddink taking over as interim manager, Chelsea’s play improved slightly, but it was nothing worth streaking to the gymnasium over. The Blues finished in 10th place, 31 points (yes 31) behind league winners Leicester City. As a result, next season will see no European football being played in southwest London, a scenario once deemed unthinkable. Nearly every single player regressed from the season before (don’t get me started on Eden Hazard), leaving incoming manager Antonio Conte with his hands full in restoring Chelsea back into the league's elite. Honorable mention: Memphis Depay (Manchester United), Christian Benteke (Liverpool), John Stones (Everton). I wrote a story on Leicester City, and specifically Jamie Vardy’s unbelievable rise in early December. At the time, the former Fleetwood Town striker -- who moonlighted as a carbon fiber technician in his downtime -- was doing things we, nor the other teams of the EPL, could explain. His tempo and sheer ferocity was not something manifested artificially, but simply the byproduct of years of struggle. As the weeks passed by and the goals continued to hit the back of the net, the dream started to become a reality. So Vardy kept scoring. And scoring... And scoring. So much so, that he broke Ruud Van Nistelrooy's Premier League record of 10 consecutive games with a goal. He finished 2nd behind Harry Kane in goals with 24, becoming the first Leicester player since Gary Lineker in 1985 to score over 20 in the top-flight. His stellar play garnered the attention from everyone, something even Roy Hodgson could no longer ignore, giving Vardy the call-up to the English national team to feature in the Euro’s this summer. What the future holds for Vardy is anyone’s guess. Will he move in a big money deal to one of England’s big clubs? Is he just a one year wonder? For a year Leicester City were kings, and Jamie Vardy was your grace. Honorable mention: Dimitri Payet (West Ham), N’golo Kante (Leicester City), Anthony Martial (Manchester United). A mocked and ridiculed manager with no particular skill set -- the tinkerman. This is the moniker English tabloids slapped on Claudio Ranieri during his time at Chelsea, which was marred by indecisiveness and a strange addiction to always tinkering with his lineup card. Ranieri would go through another 7 managerial stops before finding his way back to the Premier League, his 17th job overall, with none being worse than his previous stint with the Greek National Team. The Italian lasted just five games, winning zero, and left with the contempt of a nation and their Euro 2016 hopes in tatters. "A most unfortunate choice of coach," said the Greek football federation, after their defeat to the Faroe Islands cost Ranieri his job. His appointment at Leicester City was greeted with sneers and flat out laughter, especially from bookies, who placed 5,000-1 odds on the Foxes capturing the Premier League crown. Upon his arrival, The tinkerman was expected to do just that, but his best move may have been to keep the status quo. Old assistants from the prior regime were kept, and only 2 signings were made, albeit big ones, in N'Golo Kante and Shinji Okazaki. Fast forward, and theirs is the best story in sports: A band of brothers who know they are more than the sum of their parts, galvanized by hope and spirit, and guided by this polite, sometime ridiculed, aging, Italian coach. His side didn’t just squeak out the title either, they finished a whopping 10 points clear of nearest challengers Arsenal, consistently looking like the strongest side each weekend. Ranieri’s first major title may very well be his last, but will we even be bothered? He may have just pulled off the greatest managerial performance we’ll ever see. Honorable mention: Ronald Koeman (Southampton), Slaven Bilić (West Ham), Mauricio Pochettino (Tottenham). Every now and then a goal comes along that takes your breath away. The ones that you try to recreate in your backyard, but instead nearly tear your groin or ACL in the process. I’ll say no more, just enjoy.